Bandia Namco is getting into the narrative adventure genre and it's no other than acclaimed studio DONTNod that is developing the story-driven investigation-thriller game. Twin Mirror follows investigative journalist Sam who returns to his hometown Basswood, West Virginia. After some events he wakes up with a bloody shirt and no recollection of what happened. More details, trailer and screens inside. The title will launch in 2019 for PC and consoles. SANTA CLARA, Calif., (June 8, 2018) - Leading interactive entertainment developer and publisher BANDAI NAMCO Entertainment America Inc. today announces the psychological thriller TWIN MIRRORTM, officially marking the publisher’s first foray into the Narrative Adventure genre. TWIN MIRROR is slated to release in 2019 for the PlayStation®4 computer entertainment system, Xbox One and STEAM® for PC. 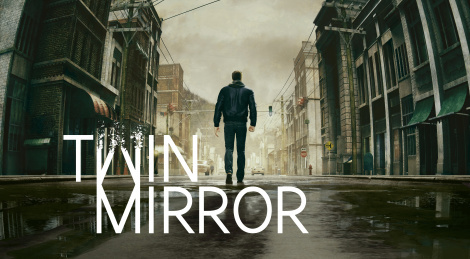 Developed by DONTNOD Entertainment, the studio behind the critically-acclaimed LIFE IS STRANGETM, TWIN MIRROR showcases a player-driven experience featuring a malleable narrative that chronicles the journey of a tormented hero who must walk a tightrope between the harsh realities of the film noir-esque Basswood, West Virginia and its dark secrets, and his own personal struggle. Players will assume the role of Sam, a 33-year-old investigative journalist who suffered a harsh breakup he’s desperately trying to overcome, returning home to bury an old friend. As Sam wakes up one morning in his motel room with a bloody shirt and no memories of his whereabouts the previous night, he embarks on a thrilling investigation to find the truth, with his mind as his only weapon. TWIN MIRROR offers the ability to dive into Sam’s painful memories to personally and uniquely shape the investigation through a series of gut-wrenching choices, each bringing the player one step closer to discovering both the truth, and Sam’s place in the world. “Now more than ever, gamers are seeking out narrative journeys that not only progress the story in a particular direction but force them to make difficult moral decisions that impact the outcome in real, dramatic ways,” said Eric Hartness, Vice President of Marketing for BANDAI NAMCO Entertainment America Inc.
“TWIN MIRROR is our first entry into the world of Narrative adventures, and by partnering with the creative artists at DONTNOD, we are working to create a title that not only meets and exceed the high standard they’ve set but forms the foundation for new and compelling narrative adventures in the years to come,” added Hervé Hoerdt, Vice President of Marketing & Digital for BANDAI NAMCO Entertainment Europe. TWIN MIRROR will be available in 2019 for the PlayStation®4 system, Xbox One, and STEAM for PC. TWIN MIRROR is currently pending a final rating with the ESRB. For more information regarding TWIN MIRROR and other titles from BANDAI NAMCO Entertainment America Inc. please visit https://www.bandainamcoent.com, https://www.facebook.com/BandaiNamcoUS, or join the conversation at https://www.twitter.com/BandaiNamcoUS. This looks very interesting, if Dontnod can achieve the same atmosphere and level of quality they did with Life is Strange, then this will be a very excellent game. Looking forward to see more of it at E3. Some really shoddy voice acting in this trailer. Premise seems cool though. Reminds me of the Fahrenheit storyline, complete with rediculous paranormal fight scenes lol. Seems really..empty comes to mind,they may be holding a lot of the story close to their chest.Hope it pans out well though. Some really shoddy voice acting in this trailer. I think Life is Strange had very good voice acting. But yes, the voice acting in this trailer is amateurish, maybe that impression is reinforced due to the bad writing. I mean, there are much better ways of giving exposition than a character talking to himself.